Is this the first public photo of the Samsung Galaxy S8? With the Galaxy Note 7 gaining distance in the rear view mirror, both Samsung and mobile enthusiasts alike have turned their attention to “the next big thing.” Barring an unforeseen catastrophe of similar proportion, Samsung’s next major release will be the Galaxy S8. Leaks and rumors regarding the upcoming smartphone have topped headlines in recent weeks. In retrospect, they all culminated to a Twitter post earlier today from serial product leaker Evan Blass which allegedly showcases the Galaxy S8 in all its glory. 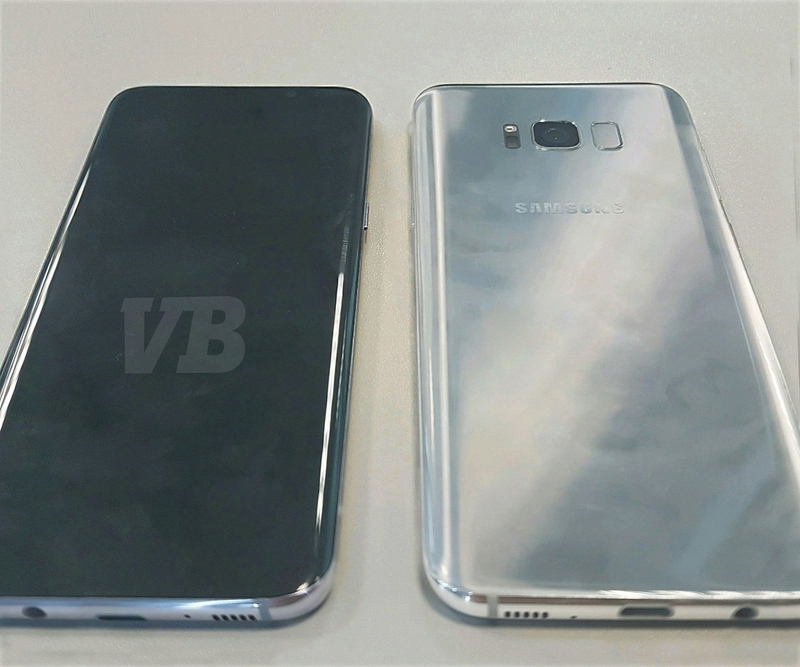 This isn’t the first time we’ve seen purported images of the Galaxy S8 although given Blass’ incredible track record, most (myself included) would place their bets on the device shown in the shared photo as being the real deal. The most notable takeaway here – which aligns with earlier rumors – is the “infinity” display on the front of the smartphone. The rumor mill suggests there will be two sizes to choose from – 5.8-inch and 6.2-inch – although unfortunately, there’s no way to gauge the size of the screen in the leaked image without something to reference it by (a dollar bill, for example). The latest scuttlebutt on the matter suggests that in addition to the aforementioned screen size options, the phone will be powered by Qualcomm’s Snapdragon 835 (or Samsung’s own Exynos chip in select markets) with 4GB of RAM and 64GB of flash storage that’s expandable via microSD card slot. Other goodies reportedly include a 12-megapixel rear-facing camera with f/1.7 aperture lens, an 8-megapixel shooter with the same aperture on the front, a USB Type-C connector, a 3.5mm headphone jack (earlier rumors suggested Samsung would eliminate the jack), water resistance and either a 3,000mAh or 3,500mAh battery depending on which screen size you go with. Samsung confirmed earlier this month that it will not unveil its latest Galaxy S phone at Mobile World Congress in Barcelona late next month, breaking its long-running tradition and leaving the door open for another handset manufacturer to steal the show. That said, most believe the S8 will arrive sometime in mid-April although Blass says it'll launch a bit earlier on March 29. Oh wow, its...its...another slab of glass and metal with marginally improved specs from last year! As a bonus, it has the garbage Samdroid UI! Can't be ..... I don't see any smoke! dms96960 and Skidmarksdeluxe like this. The rumor mill suggests there will be two sizes to choose from – 5.8-inch and 6.2-inch – although unfortunately, there’s no way to gauge the size of the screen in the leaked image without something to reference it by (a dollar bill, for example). I hope not, I am hoping for a similar sized phone to the GS7 (which is about the same size of my HTC One M7). That feature was exclusive to the Note 7 only. I could be wrong but I don't think many users or buyers found it very helpful and useful so Samsung has decided to ditch it this time around. It could be a smart move on their part but only time will tell but maybe they'll reintroduce it at a later stage. Samsung, to its great detriment, was never able to harness and utilize the great energy potential of the Note 7's exhaust. They missed a golden opportunity to market a "guided missile flying phone". Then, designing an airfoil shape into the phone's case, along with a "smart watch" equipped with a homing beacon, the phone could have been remotely triggered to fly right to its owners hand. Tripping the phone's launch sequence, could have very easily been accomplished by licensing already available technology built into "The Clapper". Maybe Apple will pick up on that idea and claim it's their innovation without giving Samsung any credit. The Galaxy's IMO have always been their best lineup of phones. The S4 and S5 have removable battery's/Micro SD's with superb specs, are still both insanely popular/good reliable phones and now both incredibly affordable. The S6 and S7 upped the build quality/both built very well, run the best VR in the business/support wireless charging and have arguably the best displays available. If you know what your doing the Android OS is the best IMO, iOS is good but very limited. The picture above is of the supposed S8, not Note 8. So I see the fingerprint reader was moved to the rear there. Keep hating Apple fanbois, your next device will not even be on par with the current Galaxy S line. Very limited indeed. I miss my Android so much.. this IPhone 7 Plus is an overpriced paperweight that can make calls.